The HLPR chair's drive, steering motors, batteries and control electronics are positioned to keep its center of gravity--even when carrying a patient--within the wheelbase. By National Institute of Standards and Technology (NIST), Engineers at the National Institute of Standards and Technology (NIST) are developing a robotic system that may offer wheelchair-dependent people independent, powered mobility and the ability, depending on patient status, to move to and from beds, chairs and toilets without assistance. The lifting ability of the system, which is called the "HLPR Chair" (for Home Lift, Position and Rehabilitation), also should significantly reduce caregiver and patient injuries. 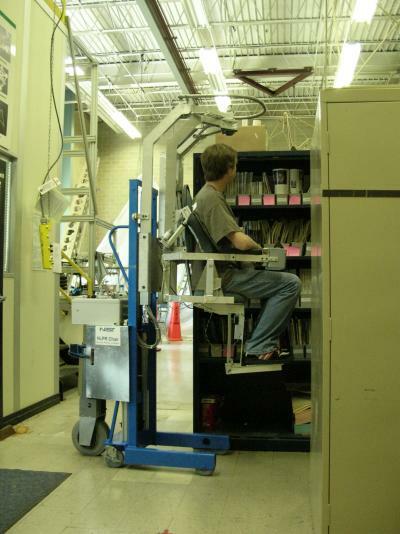 NIST research assistant demonstrates one function of the prototype robotic HLPR chair, lifting the patient to reach high shelves. The HLPR chair draws on mobile robotic technology developed at NIST for defense and manufacturing applications. It is built on an off-the-shelf forklift with a U-frame base on wheel-like casters and a rectangular vertical frame. The frame is small enough to pass through the typical residential bathroom. The user drives the chair using a joystick and other simple controls. The HLPR chair's drive, steering motors, batteries and control electronics are positioned to keep its center of gravity--even when carrying a patient--within the wheelbase. This allows a person, weighing up to 300 pounds, to rotate out, from the inner chair frame, over a toilet, chair or bed while supported by torso lifts. The torso lifts lower the patient safely into the new position. The chair frame can even remain in position to continue supporting the patient from potential side, back or front fall. In addition, the proof-of-concept prototype HLPR Chair would allow stroke victims and others to keep their legs active without supporting their entire body weight. Retractable seat and foot rest, padded torso lifts for under arms (that, when raised, act like crutches) and an open frame at the bottom of the chair facilitate leg exercises. The patient, once lifted and supported by the torso lifts, can walk as the HLPR Chair moves forward at a slow pace. The current maximum speed is 27 inches per second (0.7m/s). 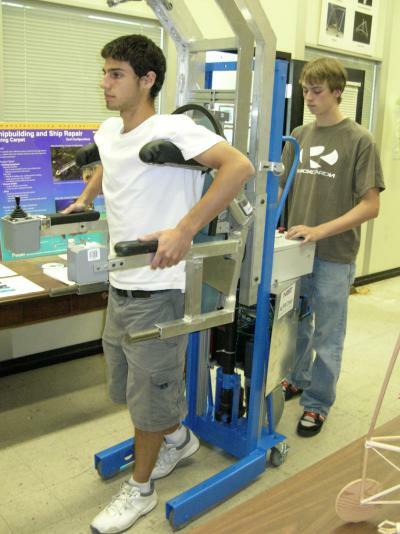 NIST research assistants demonstrate one function of the prototype robotic HLPR chair, facilitating leg exercise. NIST engineers plan to design the HLPR to autonomously dock with toilets, provide voice-activation capability so patients can call the HLPR from another location, and provide dial-in leg loading to limit leg forces during rehabilitation. - R. Bostelman and J. Albus. HLPR chair--A service robot for the healthcare industry. Third International Workshop on Advances in Service Robotics, Vienna, Austria, July 7, 2006.